Made of soft and durable high yarn-count 100% cotton fabric. Tailored specifically to the average Indian build. Have your name, favourite tag-line or any other text printed in high-quality on our Official Gear! More details below. via FedEx Priority / Delhivery. Allow 2-18 days for printing. • Made of 100% cotton. Super breathable and ideal for our Indian climate. • High yarn-count fabrics make our T-Shirts lighter, more durable and give them a premium feel. • How well a piece of clothing fits is incredibly important. Our sizing is tailored specifically to the average Indian build. • Our 2XLs & 3XLs are B-I-G. No corners have been cut here. • Finer detailing like the concealed red stitching, anthracite moon-patch and Team-BHP labels make them feel special. • Get your name, Team-BHP handle, favourite tag-line, car registration or any other text printed on your personalized merchandise! • Personalized merchandise takes between 2 - 20 days to be printed, before the item is dispatched. • Note that the chosen text will be printed in ALL CAPS regardless of how it is entered. • Ordering this product means all items in your order will ship together, only after the personalized item is ready. To avoid this, place a separate order for non-personalized items you want sooner. 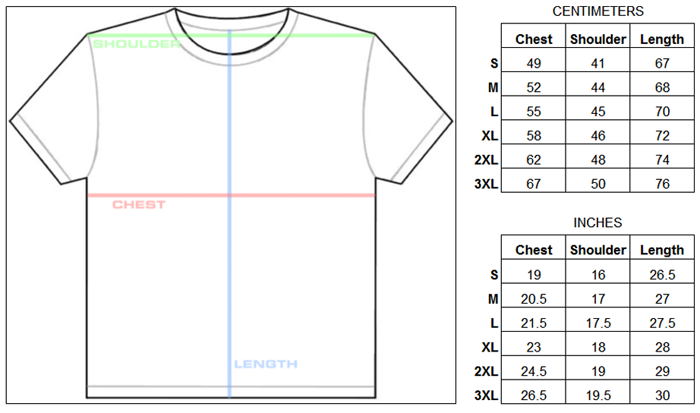 • Actual garment dimensions are shown below in inches & centimeters. For best results: measure a t-shirt that you like, and choose the size of the Team-BHP T-Shirt with the closest dimensions. • Feel free to email us if you require any help picking the right size! • The Height vs Weight chart shown below is based on feedback from BHPians who have tried on the tees. • In cells with 2 sizes mentioned, think of it like a slim-fit vs a relaxed-fit. If still in doubt, choose the size based on which end of the weight-range you belong to for that cell. • GSM (grams/sq m) is an incomplete way to gauge fabric quality, as it's based purely on weight. It's like judging a car based on kerb weight alone. We've ignored GSM and instead focused on all the individual parameters that make a great fabric. • Yarn count is important. The higher the number, the finer the yarn. Cheap tees are made of coarse '20s' yarn, while '24s' yarn is used in your average tee. Our black tees are made from super-fine '30s' yarn...you can feel the difference. • Our white tees are made from '26s', and that's because when we saw the '30s' white, it was slightly see-through. So, we chose a slightly thicker '26s' for the white. • The thinner the yarn, the tighter it has to be knit. This higher knitting gauge helps the fabric hold its shape for longer too. • The black fabric is a bit stretchier than the white. Some people even assume it has Lycra blended in, but nope - it's pure cotton! • We've put our fabric through specialized garment lab tests to ensure it meets the standards for shrinkage and colour fastness, although if you're particular - it doesn't hurt to wash them separately the first time. • Usually, a 'fit' is perfected for a middle-size (e.g. Large) and then, simple additions/subtractions are made to the individual dimensions to create the other sizes. This formulaic approach is called 'grading', and it's a rather low-effort & inaccurate way to do it. People don't increase in all dimensions proportionally! Instead of doing it this way, we've fine-tuned the fit of each size individually, based on feedback from several people who wore our samples. • There's a mentality in the garment industry of not making 2XL & 3XL too big, since the fabric saved there can be used to make additional smaller pieces (manufacturers get paid per piece). We've not cut corners here, and our 3XL is B-I-G! • The Team-BHP labels are digitally woven (rather than printed or heat-transferred). This means they won't rub off or fade, even after several washes.